Event sourcing (ES) and Command Query Responsibility Segregation (CQRS) are frequently mentioned together. Although neither one necessarily implies the other, you will see that they do complement each other. This chapter introduces the key concepts that underlie event sourcing, and provides some pointers on the potential relationship with the CQRS pattern. This chapter is an introduction; Chapter 4, "A CQRS and ES Deep Dive," explores event sourcing and its relationship with CQRS in more depth. Events happen in the past. For example, "the speaker was booked," "the seat was reserved," "the cash was dispensed." Notice how we describe these events using the past tense. Events are immutable. Because events happen in the past, they cannot be changed or undone. However, subsequent events may alter or negate the effects of earlier events. For example, "the reservation was cancelled" is an event that changes the result of an earlier reservation event. Events are one-way messages. Events have a single source (publisher) that publishes the event. One or more recipients (subscribers) may receive events. Typically, events include parameters that provide additional information about the event. For example, "Seat E23 was booked by Alice." In the context of event sourcing, events should describe business intent. For example, "Seat E23 was booked by Alice" describes in business terms what has happened and is more descriptive than, "In the bookings table, the row with key E23 had the name field updated with the value Alice." Aggregates define consistency boundaries for groups of related entities; therefore, you can use an event raised by an aggregate to notify interested parties that a transaction (consistent set of updates) has taken place on that group of entities. Every aggregate has a unique ID; therefore, you can use that ID to record which aggregate in the system was the source of a particular event. For the remainder of this chapter, we will use the term aggregate to refer to a cluster of associated objects that are treated as a unit for the purposes of data changes. This does not mean that event sourcing is directly related to the DDD approach; we are simply using the terminology from DDD to try to maintain some consistency in our language in this guide. It could store the total number of bookings for a particular conference and adjust this number whenever someone makes or cancels a booking. You can think of the number of bookings as being an integer value stored in a specific column of a table that has a row for each conference in the system. It could store all the booking and cancellation events for each conference and then calculate the current number of bookings by replaying the events associated with the conference for which you wanted to check the current total number of bookings. A process manager or a UI issues a command to reserve seats for two attendees to the conference with an ID of 157. The command is handled by the command handler for the SeatsAvailability aggregate type. If necessary, the object-relational mapping (ORM) layer populates an aggregate instance with data. The ORM layer retrieves the data by issuing a query against the table (or tables) in the data store. This data includes the existing number of reservations for the conference. The command handler invokes the business method on the aggregate instance to make the reservations. The SeatsAvailability aggregate performs its domain logic. In this example, this includes calculating the new number of reservations for the conference. The ORM persists the information in the aggregate instance to the data store. The ORM layer constructs the necessary update (or updates) that must be executed. For a definition of process manager, see Chapter 6, "A Saga on Sagas." Figure 1 provides a deliberately simplified view of the process. In practice, the mapping performed by the ORM layer will be significantly more complex. You will also need to consider exactly when the load and save operations must happen to balance the demands of consistency, reliability, scalability, and performance. Figure 2 illustrates the second approach—using event sourcing in place of an ORM layer and a relational database management system (RDBMS). You might decide to implement the event store using an RDBMS. The relational schema will be much simpler than the schema used by the ORM layer in the first approach. You can also use a custom event store. CQRS/ES makes it easy to change your technologies. For example, you could start with a file-based event store for prototyping and development, and later switch to a Microsoft Azure table-based store for production. The following list of steps corresponds to the numbers in Figure 2. Note that steps one, three, and four are the same as for the solution that uses the ORM layer. 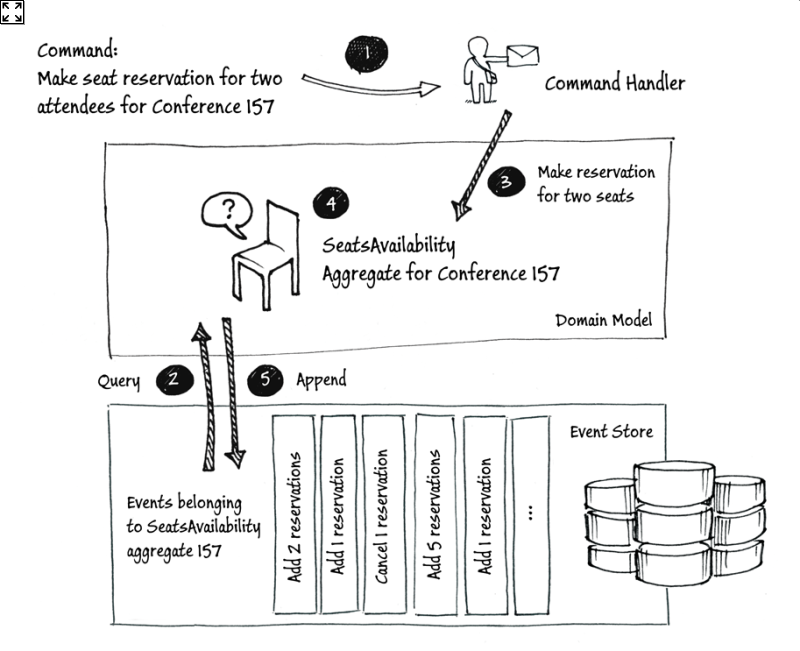 A process manager or a UI issues a command to reserve seats for two attendees to a conference with an ID of 157. The command is handled by the command handler for the SeatsAvailability aggregate type. An aggregate instance is populated by querying for all of the events that belong to SeatsAvailability aggregate 157. The SeatsAvailability aggregate performs its domain logic. In this example, this includes calculating the new number of reservations for the conference. The aggregate creates an event to record the effects of the command. The system appends the event that records making two new reservations to the list of events associated with the aggregate in the event store. This second approach is simpler because it dispenses with the ORM layer, and replaces a complex relational schema in the data store with a much simpler one. The data store only needs to support querying for events by aggregate ID and appending new events. You will still need to consider performance and scalability optimizations for reading from and writing to the store, but the impact of these optimizations on reliability and consistency should be much easier to understand. Some optimizations to consider are using snapshots so you don't need to query and replay the full list of events to obtain the current state of the aggregate, and maintaining cached copies of aggregates in memory. You must also ensure that you have a mechanism that enables an aggregate to rebuild its state by querying for its list of historical events. What you have also gained with the second approach is a complete history, or audit trail, of the bookings and cancellations for a conference. Therefore, the event stream becomes your only source of truth. There's no need to persist aggregates in any other form or shape since you can easily replay the events and restore the state of the system to any point in time. In some domains, such as accounting, event sourcing is the natural, well-established approach: accounting systems store individual transactions from which it is always possible to reconstruct the current state of the system. Event sourcing can bring similar benefits to other domains. For additional insights into using events as a storage mechanism, see Events as a Storage Mechanism by Greg Young. Why should I use event sourcing? So far, the only justification we have offered for the use of event sourcing is the fact that it stores a complete history of the events associated with the aggregates in your domain. This is a vital feature in some domains, such as accounting, where you need a complete audit trail of the financial transactions, and where events must be immutable. Once a transaction has happened, you cannot delete or change it, although you can create a new corrective or reversing transaction if necessary. The primary benefit of using event sourcing is a built-in audit mechanism that ensures consistency of transactional data and audit data because these are the same data. Representation via events allows you to reconstruct the state of any object at any moment in time. The following list describes some of the additional benefits that you can derive from using event sourcing. The significance of the individual benefits will vary depending on the domain you are working in. Performance. Because events are immutable, you can use an append-only operation when you save them. Events are also simple, standalone objects. Both these factors can lead to better performance and scalability for the system than approaches that use complex relational storage models. Simplification. Events are simple objects that describe what has happened in the system. By simply saving events, you are avoiding the complications associated with saving complex domain objects to a relational store; namely, the object-relational impedance mismatch. "Another problem with the having of two models is that it is necessarily more work. One must create the code to save the current state of the objects and one must write the code to generate and publish the events. No matter how you go about doing these things it cannot possibly be easier than only publishing events, even if you had something that made storing current state completely trivial to say a document storage, there is still the effort of bringing that into the project." —Greg Young - Why use Event Sourcing? Audit trail. Events are immutable and store the full history of the state of the system. As such, they can provide a detailed audit trail of what has taken place within the system. Integration with other subsystems. Events provide a useful way of communicating with other subsystems. Your event store can publish events to notify other interested subsystems of changes to the application's state. Again, the event store provides a complete record of all the events that it published to other systems. Deriving additional business value from the event history. By storing events, you have the ability to determine the state of the system at any previous point in time by querying the events associated with a domain object up to that point in time. This enables you to answer historical questions from the business about the system. In addition, you cannot predict what questions the business might want to ask about the information stored in a system. If you store your events, you are not discarding information that may prove to be valuable in the future. Production troubleshooting. You can use the event store to troubleshoot problems in a production system by taking a copy of the production event store and replaying it in a test environment. If you know the time that an issue occurred in the production system, then you can easily replay the event stream up to that point to observe exactly what was happening. Fixing errors. You might discover a coding error that results in the system calculating an incorrect value. Rather than fixing the coding error and performing a risky manual adjustment on a stored item of data, you can fix the coding error and replay the event stream so that the system calculates the value correctly based on the new version of the code. Testing. All of the state changes in your aggregates are recorded as events. Therefore, you can test that a command had the expected effect on an aggregate by simply checking for the event. "Event sourcing can also help with complex testing scenarios where you need to verify that a given action triggered a specific result. This is especially relevant for negative results, where you need to verify that an action did not trigger a result; this is frequently not verified when writing tests, but can easily be instrumented when the changes are being recorded through events." Flexibility. A sequence of events can be projected to any desired structural representation. "As long as you have a stream of events, you can project it to any form, even a conventional SQL database. For instance, my favorite approach is to project event streams into JSON documents stored in a cloud storage." —Rinat Abdullin, Why Event Sourcing? Chapter 4, "A CQRS and ES Deep Dive," discusses these benefits in more detail. 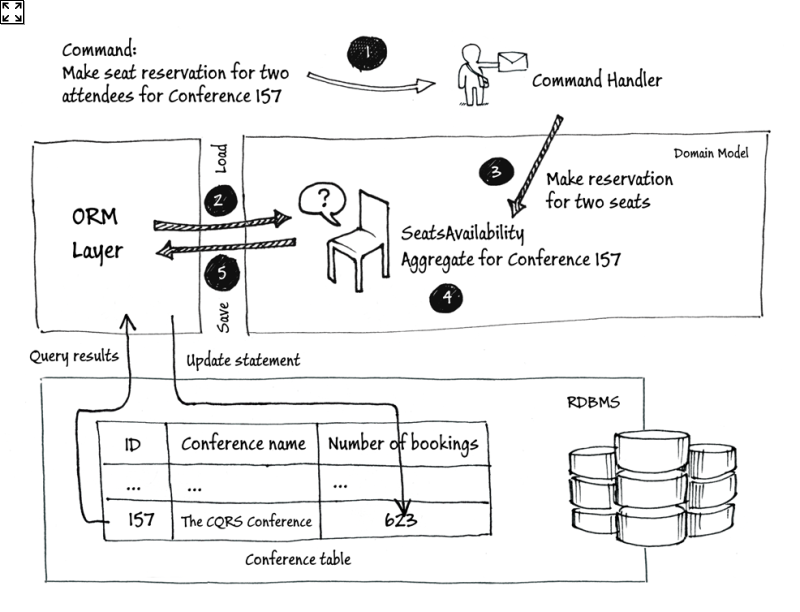 There are also many illustrations of these benefits in the reference implementation described in the companion guide Exploring CQRS and Event Sourcing. "From experience, ORMs lead you down the path of a structural model while ES leads you down the path of a behavioral model. Sometimes one just makes more sense than the other. For example, in my own domain (not model) I get to integrate with other parties that send a lot of really non-interesting information that I need to send out again later when something interesting happens on my end. It's inherently structural. Putting those things into events would be a waste of time, effort, and space. Contrast this with another part of the domain that benefits a lot from knowing what happened, why it happened, when it did or didn't happen, where time and historical data are important to make the next business decision. Putting that into a structural model is asking for a world of pain. It depends, get over it, choose wisely, and above all: make your own mistakes." Performance. Although event sourcing typically improves the performance of updates, you may need to consider the time it takes to load domain object state by querying the event store for all of the events that relate to the state of an aggregate. Using snapshots may enable you to limit the amount of data that you need to load because you can go back to the latest snapshot and replay the events from that point forward. See the chapter "A CQRS and ES Deep Dive," for more information about snapshots. Versioning. You may find it necessary to change the definition of a particular event type or aggregate at some point in the future. You must consider how your system will be able to handle multiple versions of an event type and aggregates. Querying. Although it is easy to load the current state of an object by replaying its event stream (or its state at some point in the past), it is difficult or expensive to run a query such as, "find all my orders where the total value is greater than $250." However, if you are implementing the CQRS pattern, you should remember that such queries will typically be executed on the read side where you can ensure that you can build data projections that are specifically designed to answer such questions. The CQRS pattern and event sourcing are frequently combined; each adding benefit to the other. Chapter 2, "Introducing the Command Query Responsibility Segregation Pattern," suggested that events can form the basis of the push synchronization of the application's state from the data store on the write side to the data store on the read side. Remember that typically the read-side data store contains denormalized data that is optimized for the queries that are run against your data; for example, to display information in your application's UI. "ES is a great pattern to use to implement the link between the thing that writes and the thing that reads. It's by no means the only possible way to create that link, but it's a reasonable one and there's plenty of prior art with various forms of logs and log shipping. The major tipping point for whether the link is "ES" seem to be whether the log is ephemeral or a permanent source of truth. The CQRS pattern itself merely mandates a split between the write and the read thing, so ES is strictly complementary." "Event sourcing is about the state of the domain model being persisted as a stream of events rather than as a single snapshot, not about how the command and query sides are kept in sync (usually with a publish/subscribe message-based approach)." You can use the events you persist in your event store to propagate all the updates made on the write side to the read side. The read side can use the information contained in the events to maintain whatever denormalized data you require on the read side to support your queries. Notice how the write side publishes events after it persists them to the event store. This avoids the need to use a two-phase commit, which you would need if the aggregate were responsible for saving the event to the event store and publishing the event to the read side. Normally, these events will enable you to keep the data on the read side up to date practically in real time; there will be some delay due to the transport mechanism, and Chapter 4, "A CQRS and ES Deep Dive" discusses the possible consequences of this delay. You can also rebuild the data on the read side from scratch at any time by replaying the events from your event store on the write side. You might need to do this if the read side data store got out of synchronization for some reason, or because you needed to modify the structure of the read-side data store to support a new query. You need to be careful replaying the events from the event store to rebuild the read-side data store if other bounded contexts also subscribe to the same events. It might be easy to empty the read-side data store before replaying the events; it might not be so easy to ensure the consistency of another bounded context if it sees a duplicate stream of events. 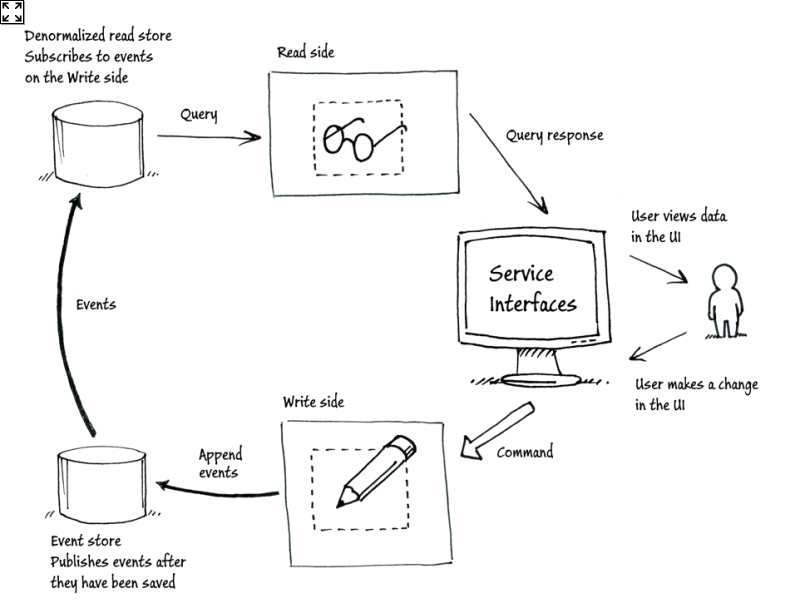 Remember that the CQRS pattern does not mandate that you use different stores on the read side and write side. You could decide to use a single relational store with a schema in third normal form and a set of denormalized views over that schema. However, replaying events is a very convenient mechanism for resynchronizing the read-side data store with the write-side data store. You can use event sourcing without also applying the CQRS pattern. The ability to rebuild the application state, to mine the event history for new business data, and to simplify the data storage part of the application are all valuable in some scenarios. However, this guide focuses on using event sourcing in the context of the CQRS pattern. If you are using event sourcing, you will need a mechanism to store your events and to return the stream of events associated with an aggregate instance so that you can replay the events to recreate the state of the aggregate. This storage mechanism is typically referred to as an event store. You may choose to implement your own event store, or use a third-party offering, such as Jonathan Oliver's EventStore. Although you can implement a small-scale event store relatively easily, a production quality, scalable one is more of a challenge. Chapter 8, "Epilogue: Lessons Learned," summarizes the experiences that our team had implementing our own event store. Typically, when you implement the CQRS pattern, aggregates raise events to publish information to other interested parties, such as other aggregates, process managers, read models, or other bounded contexts. When you use event sourcing, you persist these same events to an event store. This enables you to use those events to load the state of an aggregate by replaying the sequence of events associated with that aggregate. Therefore, whenever an aggregate instance raises an event, two things must happen. The system must persist the event to the event store, and the system must publish the event. In practice, not all events in a system necessarily have subscribers. You may raise some events solely as a way to persist some properties of an aggregate. Whenever the system needs to load the current state of an aggregate, it must query the event store for the list of past events associated with that aggregate instance. Events are not complex data structures; typically, they have some standard metadata that includes the ID of the aggregate instance they are associated with and a version number, and a payload with the details of the event itself. You do not need to use a relational database to store your events; you could use a NoSQL store, a document database, or a file system. Stored events should be immutable and are always read in the order in which they were saved, so saving an event should be a simple, fast append operation on the underlying store. When you load the persisted events, you will load them in the order in which they were originally saved. If you are using a relational database, the records should be keyed using the aggregate ID and a field that defines the ordering of events. If an aggregate instance has a large number of events, this may affect the time that it takes to replay all of the events to reload the state of the aggregate. One option to consider in this scenario is to use a snapshot mechanism. In addition to the full stream of events in the event store, you can store a snapshot of the state of the aggregate at some recent point in time. To reload the state of the aggregate, you first load the most recent snapshot, then replay all of the subsequent events. You could generate the snapshot during the write process; for example, by creating a snapshot every 100 events. How frequently you should take snapshots depends on the performance characteristics of your underlying storage. You will need to measure how long it takes to replay different lengths of event streams to determine the optimum time to create your snapshots. As an alternative, you could cache heavily used aggregate instances in memory to avoid repeatedly replaying the event stream. When an event store persists an event, it must also publish that event. To preserve the consistency of the system, both operations must succeed or fail together. The traditional approach to this type of scenario is to use a distributed, two-phase commit transaction that wraps together the data store append operation and the messaging infrastructure publishing operation. In practice, you may find that support for two-phase commit transactions is limited in many data stores and messaging platforms. Using two-phase commit transactions may also limit the performance and scalability of the system. For a discussion of two-phase commit transactions and the impact on scalability, see the article "Your Coffee Shop Doesn't Use Two-Phase Commit" by Gregor Hohpe. One of the key problems you must solve if you choose to implement your own event store is how to achieve this consistency. For example, an event store built on top of Azure table storage could take the following approach to maintain consistency between persisting and publishing events: use a transaction to write copies of the event to two entities in the same partition in the same table; one entity stores an immutable event that constitutes part of the event stream of the aggregate; the other entity stores an event that is part of a list of events pending publication. You can then have a process that reads the list of events pending publication, guarantees to publish those events at least once, and then after publication removes each event from the pending list. An additional set of problems related to consistency occurs if you plan to scale out your event store across multiple storage nodes, or use multiple writers to write to the store. In this scenario, you must take steps to ensure the consistency of your data. The data on the write side should be fully consistent, not eventually consistent. For more information about the CAP theorem and maintaining consistency in distributed systems, see the next chapter "A CQRS and ES Deep Dive."